NEW YORK, Feb. 9, 2014 – The bathroom – it’s where the day begins and ends, where we go to relax in a warm, fragrant tub or recharge under a powerful shower. From city apartments to spacious country homes, the bathroom is our refuge. Thanks to today’s innovations in technology and design, a bathroom can become much more – an oasis of luxury, beauty and well-being, whatever its size. GROHE’S new Grandera™ line includes superbly designed, technically advanced faucets, tub fillers, dispensers, lights and fittings. Combined with GROHE’s array of showers, Grandera fixtures transform any bathroom into a customized spa. “Once purely functional, today’s bathroom serves many purposes,” says Cheryl Dixon, Head of Brand and Trade Marketing for GROHE America, a division of GROHE AG, the world’s leading provider of kitchen and bath fittings. “There are so many innovations in terms of showers and tubs, lighting, faucets and new perspectives in interior design – it’s now possible to optimize the most basic bathroom to create an energizing and efficient morning ritual or a luxurious spa experience in one’s own home.” GROHE recently introduced its Grandera™ line of superbly designed faucets, free-standing tub fillers, accessories, lights and fittings that combine with GROHE’s array of shower systems and topnotch technology to convert a bathroom into a customized spa. “The spa bathroom concept is certainly trending,” says New York-based interior designer, Guillaume Gentet, who spoke at the Kitchen & Bath Industry Show in Las Vegas. He offers these tips for designing a luxurious spa bathroom that is stylish, sustainable and safe. Appeal to Your Senses. Sound and scent set the mood for a relaxing session in the tub. Plan your playlist, light a scented candle and place potpourri and aromatherapy oils in bowls and on lights. Fill a glass container with bars of fragrant soap. Go With the Flow. “Spa” comes from the old Flemish word for water and correct pressure and temperature, which are essential to an enjoyable, safe and sustainable bath or shower. Recently launched in the U.S., GROHE’s Grohtherm 2000® thermostat offers striking ergonomic design and German engineering. Leading-edge TurboStat® technology brings water to the correct temperature in seconds and keeps it at safe levels. Metal fixtures stay cool to the touch. The new GROHE Aquadimmer Eco automatically helps save water when switching from the bath filler to the hand shower. Clear, easy to understand pictograms show the button positions for reduced water consumption and for full flow. Keep Up the Pressure. Adjustable water pressure provides an individualized experience. GROHE'S Power& Soul® shower series features AquaDirect, a one-click spray selection making it easy to switch between four different spray styles. Rain Spray offers a soft, soothing pattern to calm the skin. Next, GROHE Rain O² is a rich spray with soft individual drops, enhanced by air for wider water drops. By adding air, the drops become bigger and the water consumption decreases, resulting in a soft and gentle spray. The Bokoma Spray™ provides a moving spray with massage-like functionality – perfect for a head or shoulder massage, and, finally, Jet – a focused circular spray that delivers a refreshing burst of water that’s ideal for stimulating the skin or cleaning the tub or shower. Featured in both photos above, GROHE'S Power&Soul® shower series features both head showers and hand showers with AquaDirect, a one-click spray selection with four spray styles: Soothing Rain Spray; gentle Rain O², enhanced by air for soft individual drops; the Bokoma Spray™ with massage functionality and Jet, a stimulating burst of water. The Euphoria™ Shower System is a combination of modern, contemporary design and functional excellence that delivers the benefits of a fully customized shower in any sized space. The system includes the award-winning Euphoria hand shower, a swiveling shower head and GROHE TurboStat technology, which delivers even water temperature while minimizing consumption, all perfectly proportioned and meticulously designed. 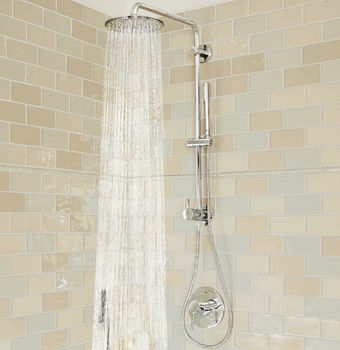 Ideal for those looking to minimize their renovation undertaking in any sized bathroom is GROHE’s Retro-Fit ™ Shower System, which transforms an existing standard shower into a luxurious full-shower system with both a shower head and hand shower. The shower system also comes with GROHE DreamSpray technology. Privacy Please. Enclosed toilets, partitions and frosted shower glass all help to make the bathroom experience more individual and private. Gentet recommends placing sinks in an island with a two-sided, His and Hers mirror. “A couple can talk, but not see the performance of mundane morning tasks,” he advises. GROHE’s Retro-Fit ™ Shower System transforms an existing shower into a luxurious spa with both a shower head and hand shower featuring GROHE’S DreamSpray® technology. Light Up. Today’s multifunctional bathroom demands more than one kind of light. Gentet suggests brighter overhead lights in high-use areas, such as the shower and sinks and overhead lights with dimmers elsewhere. Mirrored areas need special attention as retractable overhead lights can cast shadows. Lights placed on the side of mirrors make shaving and makeup application easier and more accurate. Cut the Clutter. The best spas are noted for their simple, Zen-like décor and lack of clutter. Choose drawers to hold every bit of bathroom paraphernalia, leaving only well-designed fixtures visible. 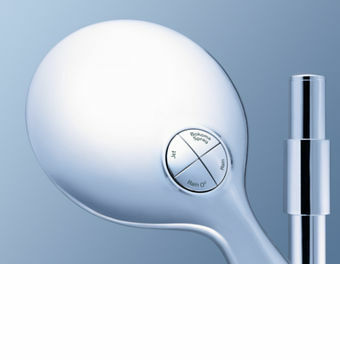 GROHE’s full range of accessories adds style and convenience and are available in an array of styles and finishes. Seek out finishes that are easy to clean and that coordinate with the rest of the décor. GROHE offers a range of finishes including GROHE StarLight® Chrome, Oil Rubbed Bronze and Brushed Nickel InfinityFinish chrome, Since bathroom wastebaskets can be unsightly, Gentet suggests building a retractable bin into the wall.